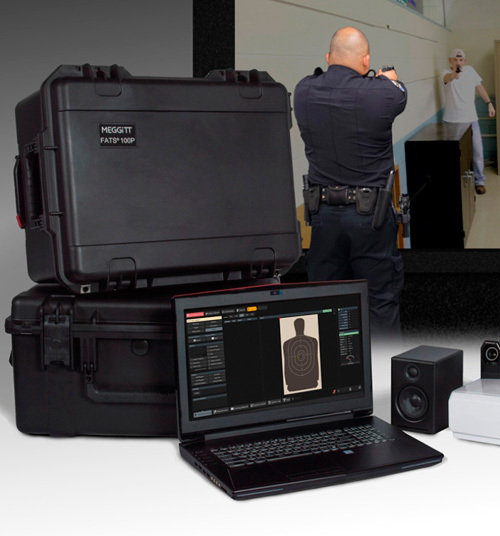 Meggitt Training Systems, the leading provider of integrated live-fire and virtual weapons training products and services for armed forces and law enforcement, recently introduced the FATS® 100P, a truly portable virtual training system. The debut occurred at the International Association of Chiefs of Police 124th Annual Conference and Exposition (IACP) on October 21-24, 2017 at the Pennsylvania Convention Center in Philadelphia. “The FATS 100P brings portable, robust simulation training to the field. This capability enables law enforcement departments the flexibility to train virtually anytime, anywhere,” said Andrea Czop, Vice President for Strategy, Sales and Marketing at Meggitt Training Systems. The FATS 100P virtual training system features advanced functionality for both instructor and trainee, delivering weapon handling and shot placement analytics, marksmanship automatic coaching tools and enhanced graphic capabilities, all in a compact package. Portable and light, the FATS 100P comes in a rugged hand-carry case the size of a large range bag that allows one person easy transportation, set up and operation. Judgmental training employs more than 250 high-definition video scenarios with 1,250 branching options to produce dynamic escalation and de-escalation training. This requires the FATS 100P user to survey and react to verbal cues, facial expressions and overall body language to quickly assess a situation and interact with individuals using proper commands and perishable skills training. In conjunction with the de-escalation of force scenarios, integrated video authoring allows the instructor to create, edit, score, load and run customer content filmed locally in familiar locations. Up to six weapon simulators, including Meggitt’s BlueFire® wireless weapons, can be run simultaneously.